HYDERABAD: Telangana Rashtra Samiti (TRS) chief K Chandrasekhar Rao has been meeting with several political leaders across the country in a bit to form a “non-BJP, non-Congress”, Federal Front for 2019 Lok Sabha elections. In the bid, he also met with Jagan Mohan Reddy of the YSR Congress, where he deputed his son and TRS working President KT Rama Rao to conduct the meeting. With YSRCP and TRS predicted to win a large chunk of the 25 seats in Andhra Pradesh and 17 seats in Telangana respectively, Jagan joining hands with KCR for the Federal Front could make it formidable, or least give the front significant bargaining power. 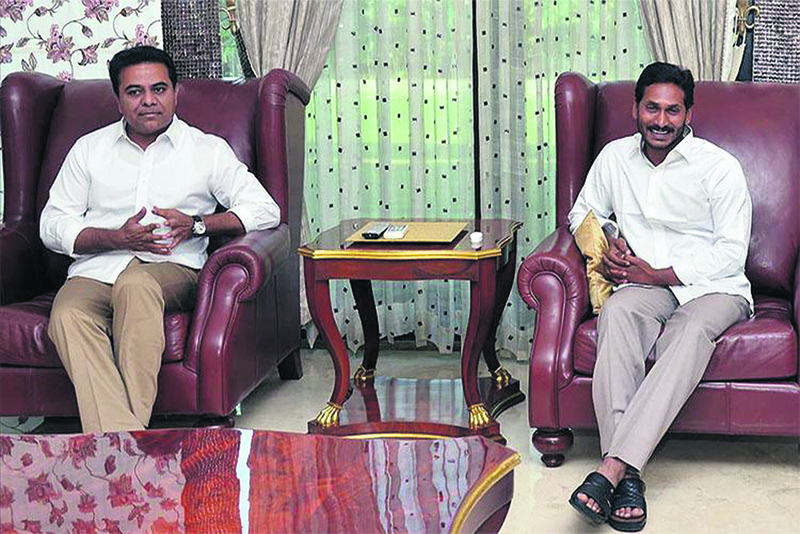 Jagan added, “If we want the Centre to take note of injustice to states, we should come together which is why the front of KCR where many MPs from different states come together for the causes of each individual state on a common platform, is very welcome.” Reddy had recently completed a 14-month long padayatra, in which he covered over 134 out of 175 Assembly constituencies in the state.